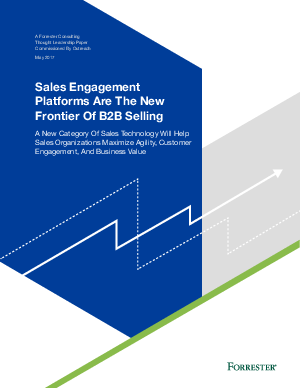 In February 2017, Outreach commissioned Forrester Consulting to evaluate opportunities for sales engagement platforms among B2B sales organizations in the US. Forrester conducted an online survey to explore how they are evolving their processes to better meet buyer needs, identify challenges with current processes and tools, and evaluate their interest in sales engagement platforms. Read the study and learn why companies using Sales Engagement Platforms are reaping a competitive advantage while others are being left behind.